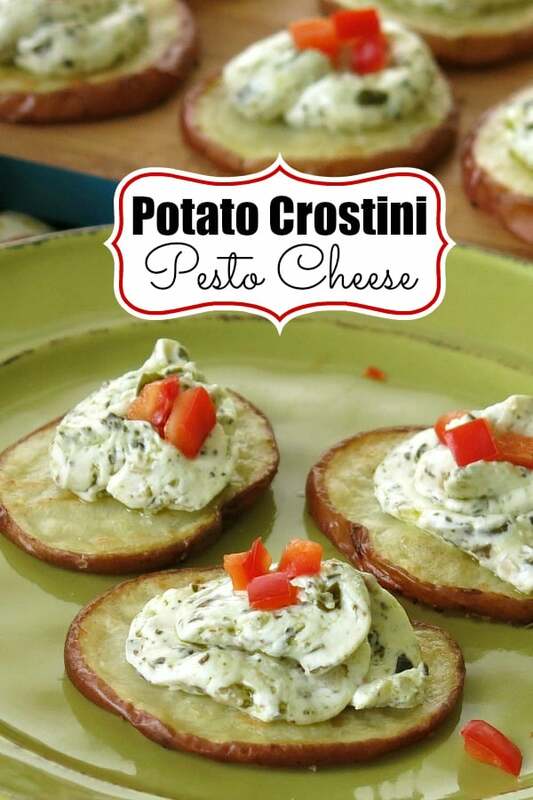 Potato Crostini with Pesto Cheese combines a few simple ingredients into a scrumptious appetizer or side dish! This post has been sponsored by Side Delights® through Kitchen PLAY. All opinions are my own. 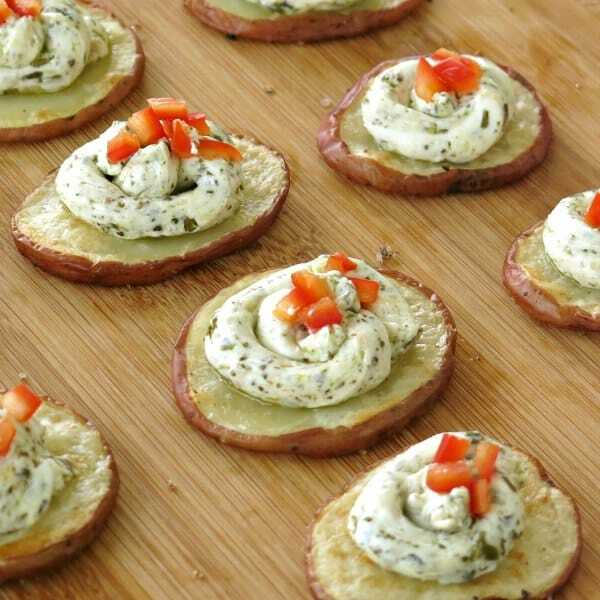 These little roasted potato rounds topped with a mixture of cream cheese and pesto have obtained the coveted status of New Favorite Recipe at our house! That title is reserved for recipes that we make and then immediately make again…and then still want another batch the next day. Luckily, we have lots of potatoes in the house thanks to Side Delights®! We are thrilled to partner with them to showcase this easy, crowd-pleasing recipe. Both are Italian inspired dishes. Crostini means “little toast.” Thinly sliced bread is toasted (usually on a baking sheet) and is typically served with a savory topping, like pesto cheese. Bruschetta comes from the word “bruscare” which means to “roast over coals” in Italian. It’s a traditional garlic bread made by rubbing thicker slices of bread with garlic and olive oil and then grilling or roasting it. No toppings necessary. But, there can be! So, yes we take creative liberties, but for good reason. Potatoes make a comforting, crispy base and make this recipe gluten-free. The bite-sized rounds are easily handled with your fingers too. Cut medium-sized potatoes into 1/2 inch slices, trying to be as consistent as possible so that the potato rounds will roast evenly. We ended up with some smallish ones, which became chips, much like our sweet potato chips. Delicious! But, it’s not what we’re going for here. A mandolin, one of our kitchen essentials, makes quick work of this step. While the potatoes are cooking, mix together softened cream cheese and prepared pesto to make the topping. Yep. It’s that easy. And, it can be made up ahead of time. Red pepper fans may want to add 1/4 to 1/2 teaspoon red pepper sauce to the mix. When the potatoes are finished, slather it on top of the roasted potatoes. Or, pipe it on! 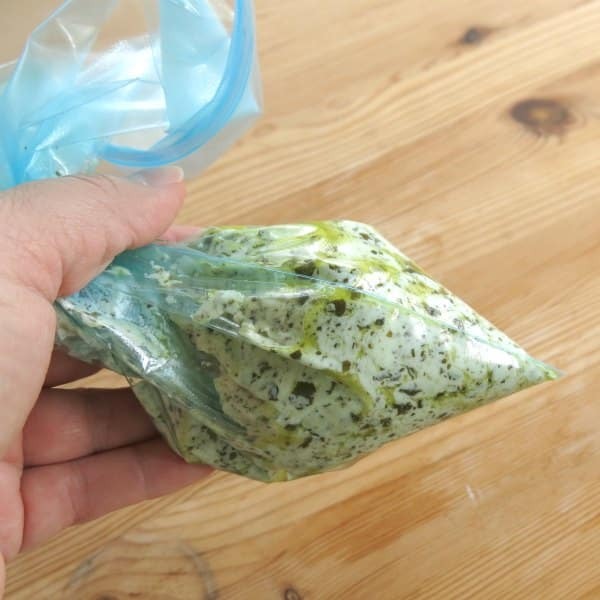 Scoop pesto cheese into the corner of a plastic bag. Snip the tip and then pipe it on. Finish with finely diced red peppers or chives. They are as scrumptious as they look! By the way, I can’t take credit for this clever use of sliced potatoes…it’s a recipe created by Side Delights®! They have an amazing recipe collection with all types of delicious ways to use potatoes. Check out their recipe index and find your new favorite recipe. 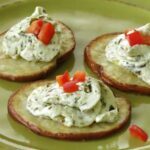 Potato Crostini with Pesto Cheese combines 5 ingredients into a scrumptious appetizer or side dish! Easy, gluten-free recipe! Spray baking sheet with cooking spray. 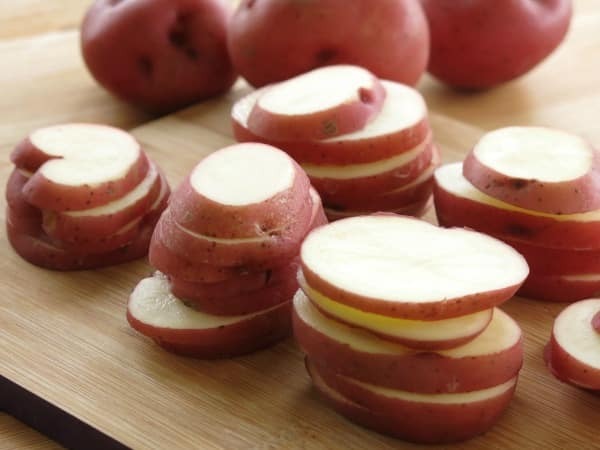 On baking sheet, arrange potatoes in a single layer. Spray potato slices lightly with additional cooking spray and sprinkle evenly with 1/4 teaspoon of garlic salt. Roast 20 to 25 minutes or until potatoes are tender and browned, turning potatoes over halfway through and sprinkling with remaining garlic salt. While potatoes are roasting, mix together cream cheese and pesto in a small bowl. Pipe or spoon about 2 teaspoons of pesto mixture onto each potato and top with red pepper. This is such a great idea for a party! We have so many gluten free friends, I love using potato as the base! I’ve used grilled potato planks as an appetizer base before. Great gluten free option. Yum! Grilled potato rounds are fantastic! These are a fun party pick up! Always looking for a GF option for my GF friends. 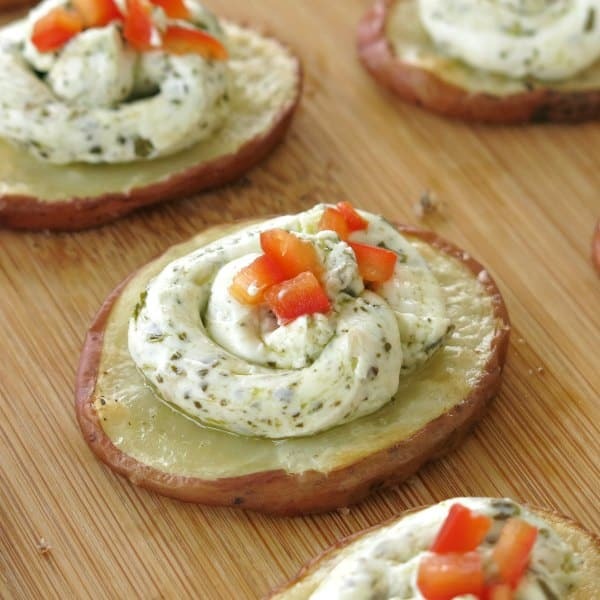 This is such a creative twist on crostini and it looks and sounds soooo delicious! What a great idea to use potato slices for the crostini! LOVE the pesto cheese.